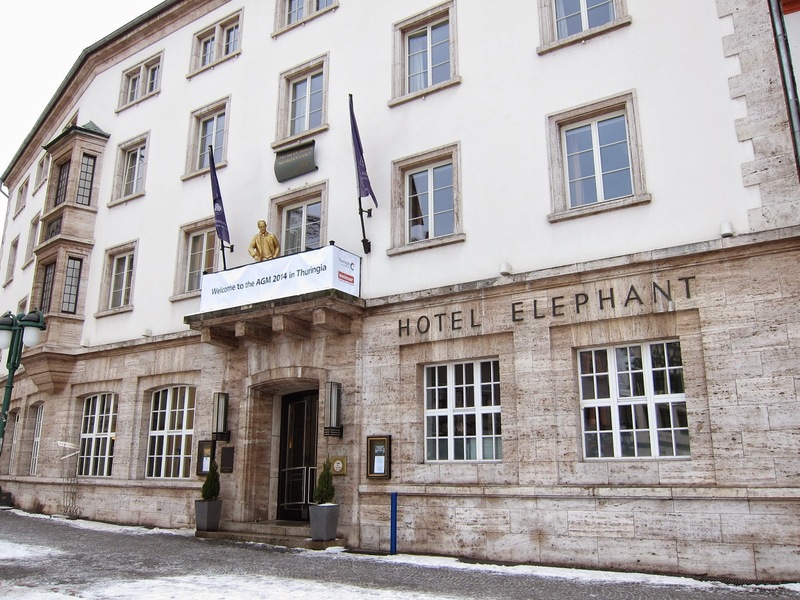 The Elephant in Weimar is a hotel with a long history. Goethe celebrated his 80th birthday there, drinking in the cellar. Hitler stayed in the run up to World War II. With a nice touch of irony, his suite has been hung with what the NAZIs would have described as “entarte Kunst” – degenerate art, including works by Kandinsky and Otto Dix. The Elephant began life in the late 17th century and an inn. It became a coaching hotel in 1741. Its glittering guest list included Mendelssohn, Tolstoy, Wagner and Hans Christian Andersen. When the Weimar became part of the communist German Democratic Republic the Elephant closed and the building was used by the Russians to accommodate trainee teachers, but the hotel re-opened in 1955. First entry in the guestbook was that of Thomas Mann. Not long after the reunification of Germany the hotel underwent a root and branch renovation. A large number of hidden cameras, placed there by the East German STASI (secret police) was discovered in the cellar ceiling. Since then guests have ranged from Russia’s President Putin and former German Chancellor Gerhard Schroder to Jennifer Lopez and Helen Mirren. It’s now part of Starwood’s Luxury Collection and unarguably among the best hotels in the former east. 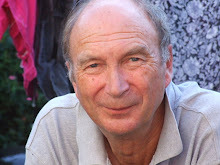 I’ve stayed there on four occasions since the Berlin Wall came down - in winter, with snow on the Marktplatz (Market Square) outside and in summer, when it was hot enough to eat a dish of scrambled eggs, cooked perfectly to my taste, in the garden. I’ve yet to eat in the Elephant's Michelin starred Anna Amalia restaurant but have dined memorably at the Gasthaus zum Weissen Schwann (White Swan) a few paces away, which it also owns, where a three course dinner for two (excluding the price of drinks) would cost around £60. 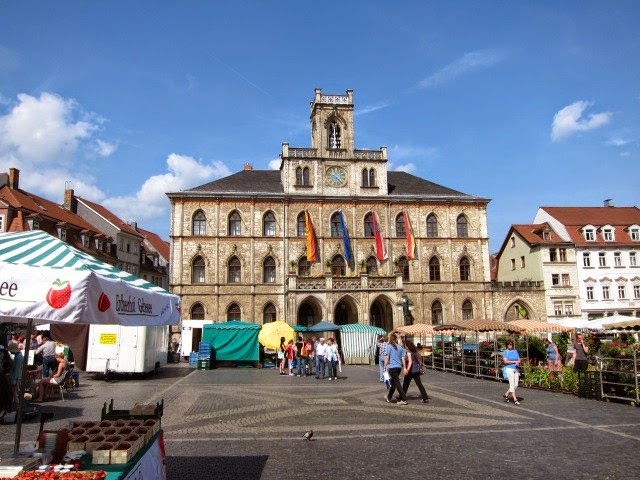 The hotel is in the centre of Weimar, a short stroll from the city’s UNESCO World Heritage sites, including Bauhaus architecture (Weimar was the centre of the Bauhaus movement) and classical buildings such as Goethe’s house and garden and the breathtaking Duchess Anna Amalia library. It’s also superb value: you could book a double room with breakfast on its website in July, for example – with an excellent buffet breakfast – for around £114.